The College recently finished an 18-month process of redesigning its website, the first major change to the site’s theme since 2012. The new website features a reimagined look, ambient video of the campus, and new content in order to highlight the student experience. Swarthmore’s Communications Office and Information Technology Services team worked on the site in conjunction with Bluecadet, a web design company that has built websites for Princeton Admissions and NASA, and interactive displays for The Franklin Institute. The Communications Department led the effort, performing focus group research on the ways that students, prospective students, faculty, parents, and alumni engage with the website, said Alisa Giardinelli, Interim Vice President of Communications. The ITS team had weekly to monthly meetings with Bluecadet, during which the company presented a proposed design and received feedback, said Mensah. Once Bluecadet finished most of the design, framework, and structure, they handed the site over to The Communications Department for information design, writing, photography, and videography. The previous version of the website, known to students and faculty by its garnet banner and maze of tabs, went online in 2012. According to Giardinelli, the website was significantly updated in 2015 because it wasn’t responsive on mobile devices. This time around, designers at ITS and Bluecadet prioritized a mobile-first approach so the site would look great on phones, iPads, and smaller laptops, said Front-End Developer Michael Kappeler. There was also a need to clean up and modernize the look of the website, said computer science student Richmond Mensah ’21. Mensah participated in the SPEED program this past summer, during which a variety of groups and individuals, including students, administration, and academic departments, previewed the website. “They wanted to have that new, cleaner type of website that’s really chic and really powerful,” said Mensah ’21. Another main goal for the site was to showcase the college community and the uniqueness of the campus, said Giardinelli. The new website makes use of a full-width, borderless display and high definition ambient video to achieve this goal. The site also offers more content and easier navigation for current and prospective students said Mensah. According to Kappeler, the design team sought to refocus the content on students and prospective students. They worked on surfacing information about campus life such as clubs and activities which was more difficult to find on the old website. The website is now complete and online; however, ITS and Communications are still working to integrate the site with other platforms such as The Dash and course catalog. The Dash runs on Drupal, the system that keeps the website up and running behind the scenes. The course catalog, however, is stored on a separate system which still has the look and feel of the old website. ITS and Communications are in the process of migrating that information over to the new system, as well as creating a resource for browsing courses throughout the Trico. As for the webpages of individual departments, ITS gives each department control over their own content, said Kappelar. 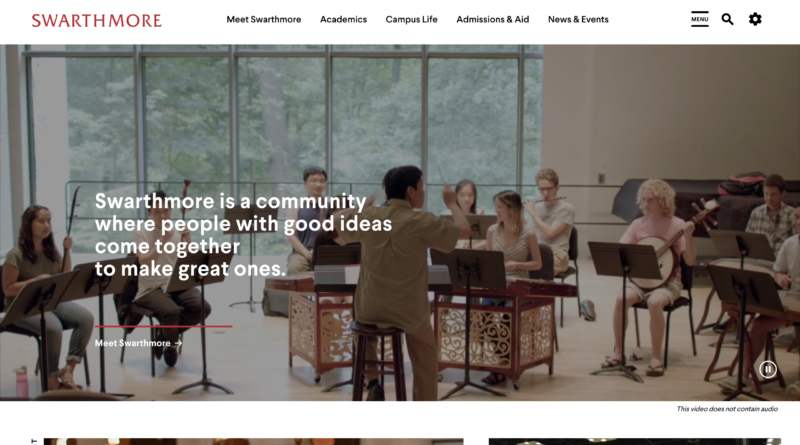 Now that the main website is finished and online, ITS can evaluate how the new design influences the way prospective students, parents, and alumni view the community. With the BEP building nearing completion and the process of building a new dining hall set in motion, the website seems to be a step towards modernizing the college for the twenty-first century. This article has been updated to more accurately reflect the process of creating the new website. I totally agree with this article. It is really helpful to self-learners for web design.